"Dr. Clif Arrington has been my general practitioner for 6 years. Blood and hair samples collected by Dr. Arrington revealed a high aluminum content, and I was experiencing borderline high blood pressure. I began chelation therapy and my blood pressure, after 2 sessions, was lower than it was at age 20. As a result of chelation therapy I feel better than I have in years. I highly recommend Dr. Arrington to those suffering the pangs of aging and those suffering from chronic illnesses. In 55 years I have never met a more caring and dedicated doctor. Those people suffering will find relief, comfort, and old-style family doctoring when visiting our good Doctor Arrington." Ed Mura, Niulii, Hawaii. Eleven years after open heart surgery with a quadruple bypass, 59 year old Doug W of Kailua-Kona began to feel the warning symptoms of renewed heart problems: tightness in the chest; angina; shortness of breath; lightheadedness. He started chelation and has become symptom free for five years. Doug continues to feel well and active in his work. Doris H (age 69) of Hilo, after experiencing the benefits of chelation for a past condition of high blood pressure and sugar triglycerides, suspended treatments for two years. Recently she suffered a stroke that left her groggy, with speech slurred, and her walking a difficult shuffle. She began chelation again three days after her stroke, traveling twice weekly three hours from Hilo to Kealakekua. Mental alertness is restored, speech improved, and she now walks normally. Erik H of Kamuela (age 83), 10 years after multiple bypass surgery in Europe, had a seizure and was told he needed surgery again. Fearful that at his age he might not survive a second major operation, he opted for chelation. At the time he could not walk across a room without experiencing severe chest pain. After 15 chelation treatments he is able to walk three miles without pain. His cholesterol has returned to normal levels and he is going on an extended trip to Europe where he will maintain a reduced maintenance treatment level (once a month). 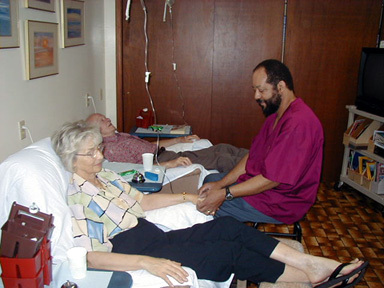 Linda B, 75 years old, was operated on for cataracts on October 19, 1989. Her eyesight got worse and she was scheduled for a second operation as her eyesight was rapidly dimming due to the onset of "macular degeneration." In February of 2000 she was declared legally blind and could not get her driver's license renewed. She went for chelation treatments in Honolulu where prices are more than double until she found Dr. Arrington on the Big Island. After approximately three weeks and about ten treatments her eyesight was so improved that she was able to pass her driver's license test. She said: " Dr. Arrington is the best candidate for sainthood." "My name is Aldo Vidali. I am 70 years old. I had a double bypass surgery performed on me in California "cowboy style" by a California doctor who left a surgical needle behind my heart. 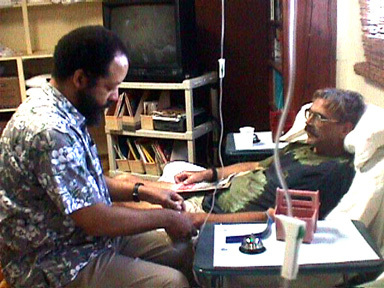 In February 2000, about five years after the taunted $40,000 miracle procedure, symptoms recurred and I was taken by emergency paramedics to the Waimea North Hawaii Medical Center for an hour of oxygen and to receive a little tube of nitro. I was billed $1300 + ambulance of $450 (a shock sufficient to give anyone a heart attack!). "Another multi-thousand dollar open heart surgery....well... thanks to Internet research, long hidden medical information made clear the true statistics of heart bypass: five years average then higher and higher risk with advancing age. "Thank God a good friend took me to Dr. Arrington. "After 10 treatments all symptoms of angina pectoris vanished. "After 20 I felt so good I decided to risk climbing down and back up the steep, long path into Pololu Valley. Anyone who tried that walk knows that if you have a heart condition climbing down and up that slope would surely be a test far more serious than any threadmill. "The greatest pleasure was hearing my son Lorenzo proudly announce to others that his Dad had actually undertaken and succeeded in doing that. "I needed no more proof to know how good the treatments are and will recommend them to all who suffer the same condition I did."